Rick Parker | Utah State Athletics Utah State senior Alex Dargenton has started 15 of the Aggies' first 21 games this season. Logan • Alex Dargenton’s height and, consequently, his choice of sport made him a little bit different than most on the Caribbean island of Martinique. While almost everyone played soccer, Dargenton and his siblings tended toward hanging out at the basketball court. “As you can imagine, the biggest difference was the weather,” Dargenton said. “It was pretty simple. The biggest difference for me is we don’t have competitive sports within the schools, so I was playing for club teams. At 6 feet, 8 inches tall now, he equaled the height of his tallest older brother and hoops was a natural choice. 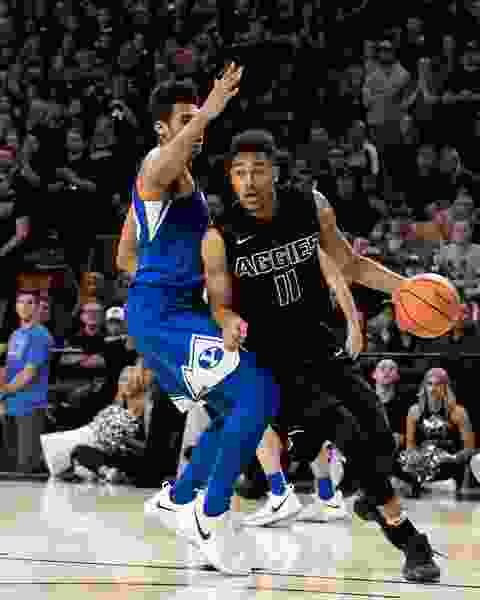 Imagine his surprise when, after Dargenton became the first family member to play college basketball, he found out that the Utah State Aggies’ front line — of which he was the major returning component — was considered small entering the 2017-18 season. “For me and my other fellow post players, we take this very personally,” Dargenton said. “People think it’s going to be a mismatch when we play bigger, stronger dudes and think we can’t get around these guys. “But we have great shooters on the team and can spread the floor, and that can create other issues for the other team,” he added. Dargenton is averaging 7.8 points a game, up from his 4.6 ppg mark in 2016-17, and the trajectory for that figure is ticking up — when he’s on the court. The lanky senior missed a pair of games with a right ankle injury just before the Mountain West Conference slate began, then reinjured the same ankle late in a Jan. 3 home victory over Fresno State. That forced Dargenton to sit out the win at UNLV, but he then started the next three contests. Against Boise State, his third start in a row, Dargenton went down 20 seconds into the contest. This time it was his left ankle that he injured. A sense of bewilderment comes through when Dargenton talks about his ankles. Don’t expect Dargenton to go down easy considering the route he had to take to get to Utah State. Although Martinique has close to 400,000 inhabitants, Dargenton’s basketball experience was confined to club play through high school. When the 17-year-old left the French island territory for the United States, he spent two years in Los Angeles, finishing at Middlebrooks Academy, where he brushed up on his English skills as well as basketball. In the 2014-15 season, Dargenton played at Laramie County Community College in Cheyenne, Wyo., before transferring to Utah State. He redshirted with the Aggies in 2015-16 and now is classified as a senior. Dargenton has a variety of moves around the basket, and Duryea has encouraged him to use his ballhandling to drive to the hoop. His 13 points against Fresno State was his career best. But Dargenton is particularly fond defensively of swatting away rivals’ attempts, like another French-speaking big man in Utah, Jazzman Rudy Gobert. “That’s my favorite. I keep an eye on the all-time blocking list” for Utah State, said Dargenton, who had 34 blocks in his 31 games last season. “Blocking shots, for the team we call it a kill because it ends the possession for the other team. Dargenton is hoping to do some of that Wednesday against Air Force. He’s expected back on the court for the Aggies against the Falcons. The Aggies’ lack of height was readily apparent against Wyoming. The Cowboys repeatedly swatted away USU forays into the paint in the first half. Duryea’s last words of the postgame news conference spoke volumes after the 85-77 loss, Utah State’s fourth in a row. “We’ve just got to find some consistency, and part of that is our depth, our bench,” Duryea said Saturday. “It’s kind of a microcosm of our team. We’re getting wildly different contributions from the bench.